Sassafras is a tree of the Laurel family. There are three species, 2 of them are found in eastern Asia, and one, Sassafras albidum, is native to eastern North America. The American sassafras is the most important. It is found from small bush size to a height of 50 to 60 feet. It has many slender branches, and the hairless leaves can be of three different types (a smooth oval, a two lobed and a three lobed leaf) sometimes all three being found on the same tree and even the same branch. The roots are large and woody, with a spongy bark. The small flowers are yellow, and the fruit is a blue berry on a red stem. The bark of the roots, formerly one of the ingredients in root beer, contains volatile oils, 80% of which is safrole. The FDA banned its use as an additive in 1960, as safrole was found to cause liver cancer in rats. The sale of sassafras tea was banned in 1976. The root bark extract and leaves are now treated commercially to produce a safrole-free product, the root bark being used as a flavoring agent and the leaves for filé powder. The safrole free extract has, unfortunately, an inferior flavor. (Safrole is similar to thujone, which is found in wormwood, and was used to make absinthe - banned since 1913). It is not possible to make a safrole free extract at home. The root bark has long been used medicinally by native Americans, and this knowledge was passed on to early settlers, probably to the Spaniards in Florida. 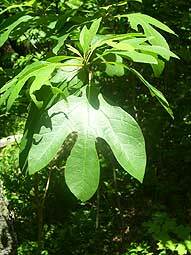 Sassafras was one of the earliest American plant drugs to reach Europe, having been used medicinally in Spain as early as the middle 1500's, and was cultivated in England sometime before 1633. The early settlers also fermented the roots with molasses to make beer, and during the Civil War sassafras tea became popular. Today the (safrole free) root bark extract is used in perfumery, as a flavoring for candy, beverages, and to make an aromatic tea.